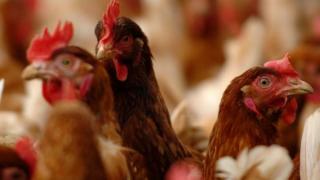 Plans for a 16,000-bird chicken farm in Powys have been approved despite objections from villagers. Philip Wells said the nearest homes were just metres away from the site in Llanwnog, near Caersws, with three poultry farms already in the area. Another resident, David Evans, objected to extra traffic on country lanes. Farmer John Wainwright told councillors his family needed to diversify to survive, but pledged to move the new unit further away from the village. Mr Wells told Powys County Council's planning committee on Thursday that villagers were "dismayed" at how close the proposed chicken farm would be to the village with the nearest homes "less than 150 metres away". He said there were already three poultry farms within 2km of the village and another two planned, with a total chicken count of more than 144,000. Mr Evans told the committee that reports saying the chicken farm would have "little impact" on health were "unacceptable". He claimed that no analysis on "the cumulative effect of clusters of farms" had been carried out, according to the Local Democracy Reporting Service. "The dangers and nuisances of additional transport on narrow country lanes has been understated," he added. Defending the proposal, Mr Wainwright said the "uncertain nature" of beef and sheep markets and the loss of farm subsidies had left his family with "no choice but to seek diversification". Liberal Democrat councillor David Selby said he had concerns about the "cumulative effect" of so many chicken farms in the area. "It's close to people's homes and they will suffer in some way because of this, and I have great sympathy," he said. "I'm concerned but would struggle to find a valid reason not to accept this."